A lot of opinions surround this little phrase. CIO (cry it out) means that you allow crying for a certain amount of time before offering comfort. The idea is that soothing yourself to sleep is a skill that has to be learned. The goal of CIO is to help your baby learn how to fall asleep on his/her own. In the first 7-8 weeks when Duke cried in the night, we would assume it was a feeding issue. Of course as he neared weeks 5-8, the stretches of time were getting longer and longer. Crying in the night was becoming less and less. Once he did his first 7-8 hour stretch, we knew he could make it that long. Now, Duke sleeps 9-9.5 hours at night and it would be a rarity for him to wake up and cry. Usually once he's asleep, he's asleep. If he does wake up and cry, I wait. I listen for the kind of cry it is and how long it goes on. If it's just a little whimpering noise, it usually subsides in a couple of minutes. If it's a full fledged screaming cry, that means something isn't okay. This has only happened 2 times. One time, he had spit up all over himself. We cleaned him up and put him back down. We're not really sure what happened the other time. 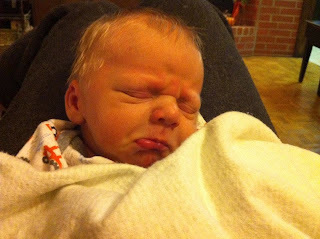 He cried for 45 minutes straight, so we burped him, tried to get out any painful gas, held him, rocked him ... whatever we could do. Looking back, it was probably a mix of an unsettled stomach and teething. Once he was calm, we put him back down. Just remember, not every cry needs your attention. Babywise calls it the "45 minute intruder." That's about when the sleep cycle changes. Sometimes Duke will stir a little bit when he's 45 minutes into his nap. I know that's not a long enough nap for him, so I wait. Usually, he'll go back to sleep until it really is time to wake up. If it's the crazy crying, I wait to see how long it goes on and if it intensifies. If I think he needs comforting, I'll get him out of his crib and put him in the swing to finish his nap. If the swing doesn't calm him down, then he's most likely hungry. This hunger thing has only happened recently and it was obvious to me that it was a growth spurt. Whether it's a nap or it's night sleep, your baby will probably cry a bit when you put them down. As Duke has gotten older, his crying time at the beginning of sleeping has decreased. Sometimes he won't cry at all. I just learned early on that crying was going to be normal and that everything really was okay. He was fed, he was burped, he was changed, and he had been awake long enough. It was time for a nap. Something Babywise encourages is that you decide when naps begin and end. So, when I say it's time for a nap, it's time for a nap. As the Queen in "Alice in Wonderland" would say, "ALWAYS MY WAY!" So, CIO does not mean you're ignoring your baby. CIO does not mean you're harming your baby. It just means you're listening to your baby's cry and assessing whether or not it needs your attention. And if it does need your attention, you decide when that will be. Of course, no one single way is going to work for every parent. But for us, this has worked. It has made our lives a little bit easier knowing that we don't need to run to his room every time he makes a noise. Hopefully this can be an encouragement to some of you other new moms out there. This is so interesting. I have always wondered what exactly CIO actually meant... And know that I know I think it sounds really great and helpful!